Snaptu has joined hands with Linkedln and have developed a mobile app for Linkedln users. The app is built on the Snaptu mobile app platform and gives the users a smartphone-like user experience to over 2,500 different mobile devices, representing around 80% of the devices sold worldwide. LinkedIn is one of the world’s largest professional networks on the Internet with more than 90 million members worldwide. LinkedIn will now be available worldwide as a part of the Snaptu mobile app, which is already used by over 30 million people worldwide. It will join a range of other popular web and online services, including Facebook, Twitter and over 30 other news, sport, weather and entertainment services. Snaptu is a free mobile application platform that runs on virtually every type of Internet-enabled mobile phones. It allows the user to access popular services, varying from social networks like Facebook, Twitter, Flickr and Picasa to entertainment news, blogs, sports and local guides. It has partnerships with mobile operators and device manufacturers across the US, Europe and Asia, including Nokia, SonyEricsson, RIM, Airtel, Vodafone Essar, Reliance, Idea, Tata Docomo, Aircel, Samsung, Micromax, Karbonn, Fly, Spice, Lava, Beetel and Zen, so millions of mobile users will have the Snaptu app pre-loaded on their device. “LinkedIn has become as much a part of the working life as the mobile phone, so it’s very exciting for us to bring the two together. LinkedIn recognizes the value in reaching beyond the smartphone market to bring quality services to every device, leveraging the Snaptu mobile apps platform. The Snaptu platform provides the complete technical and distribution structure to help publishers and service owners massively expand their mobile user base and unravel the immense monetization potential in the global market. 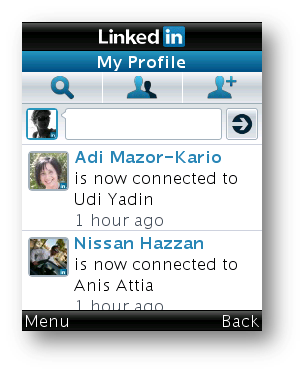 We are delighted LinkedIn has joined the likes of Facebook and ESPN to offer an outstanding user experience to all mobile users, regardless of their device,” said Snaptu CEO Ran Makavy.